When I saw this recipe, I knew I needed to give it a whirl. Another strawberry recipe? OK! And, since tomatoes are not in their prime yet, I could settle for a sweeter version of the traditional Italian finger food. The instructions seemed straightforward, the ingredients fresh and healthy, and the flavors seemed like they would be delicious. Let your taste buds go crazy with this one! Combine the tablespoon of sugar and strawberries in a small bowl. Cover, and refrigerate for about 2-3 hours, or until strawberries have slightly softened. 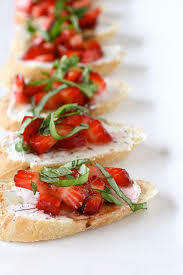 Spread the goat cheese evenly over lightly toasted slices of bread, followed by spoonful of the strawberry mixture. Drizzle with the olive oil and balsamic vinegar. Top each bruschetta with basil. Season with freshly ground black pepper. Source: Adapted from Whole Foods Market.